By Niamh Geoghegan | April 1, 2014. In March, the Metro Herald teamed up with one of the biggest retailers in fashion, Forever 21, along with up and coming designers from the National College of Art and Design (NCAD), to host a fashion challenge with a twist. The challenge was to create and design a garment completely made out of recycled Metro Herald newspapers. The second year NCAD fashion students had their class of 24 assigned into five teams with each student putting forward one of their own individual designs. One design was then chosen from each group by the tutors and the head of the Fashion and Textiles Department. Each team’s design was showcased in Forever 21 in the Jervis shopping centre for one week, where spectators and shoppers could vote for their favourite from the five garments. 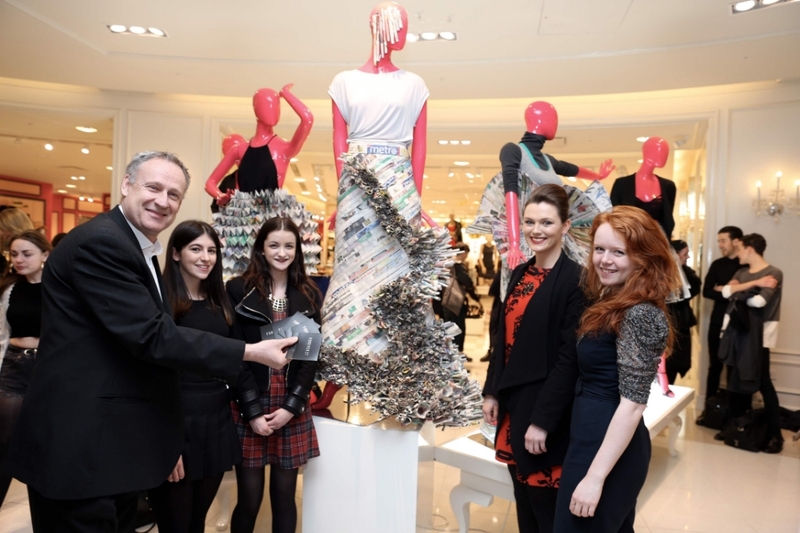 The winning design by team leader Ally Nolan and Aideen Gaynor, Ailbhe Griffin, Vikki Kavanagh and Zoe Redmond was announced at an exclusive event in Forever 21 on Thursday, March 26th. 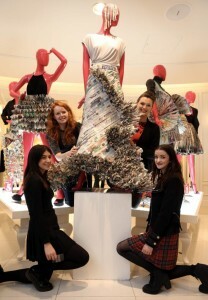 Their victorious design saw the team having to roll up over 2,000 strips of newspaper to use on their garment. The effort paid off when they were presented with a €500 voucher to spend in-store. While not winning the competition, fellow team leader Nino Sanaia was delighted to have taken part in the challenge, however admitted that using the newspaper as their sole material proved to be quite difficult. “It wasn’t ideal working with paper as it was hard trying to figure out proportions. For example, our team’s skirt was made from ten A1 sheets of paper but it’s really tiny”, Sanaia explained. “We are always told to make things out of paper first to establish a basic structure that you can apply to any material, so it was good in that sense”, she added. The students now head back to NCAD to work on their various projects; however Sanaia feels that the experience has equipped her with a vital skill set that can be of great benefit to her in the future. “The experience was really good because it was so quick. Our projects usually last a couple of months, so we do weeks and weeks of design development before we reach the final result. However, at the challenge we were forced to design, and develop our ideas in three days”, she said.